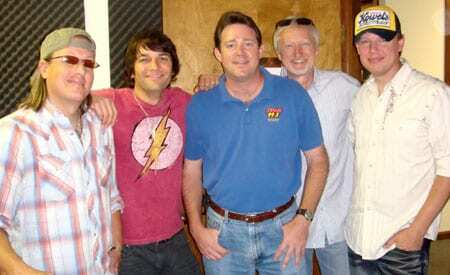 Randy Montana opened the Sugarland tour stop in Charlottesville, VA and stopped by WCYK for a visit. (L-R): Montana and WCYK PD/Afternoon DJ Lisa Allen. After a narrow second place finish last week, Darius Rucker’s “Come Back Song” enters the No. 1 position with a gain of 116 spins. Kenny Chesney’s “The Boys Of Fall” slips back to No. 2, despite a small spin gain. Songs in the Top 10 are experiencing something they haven’t had in some time—movement. Taylor Swift’s “Mine” gets a 169 spin boost to take the No. 3 spot, followed by Sugarland’s “Stuck Like Glue,” which moves No. 6-4. Filling out the top 5 is The Band Perry’s “If I Die Young,” which makes a big jump after two weeks at No. 8. The brigade of new superstar singles seems endless. Last week’s big debut was Keith Urban’s “Put You In A Song,” which shoots up to No. 33. A couple paces behind at No. 33 is Blake Shelton’s “Who Are You When I’m Not Looking,” in only its third week charting. Topping things off, three superstar artists made big debuts with zero prior reports. Toby Keith’s “Bullets In The Gun” leads the charge, landing at No. 59 with a big gain of 429 spins. Tim McGraw’s “Felt Good On My Lips” is next in line at No. 65, and Lady Antebellum’s “Hello World” is right behind at No. 68. Newer male artists are also feeling the love right now. David Adam Byrnes’ debut single “Sweet Distraction” is up to No. 28, followed closely by Chris Young’s “Voices” at No. 29. Frankie Ballard’s “Tell Me You Get Lonely” is still gaining spins at No. 41. 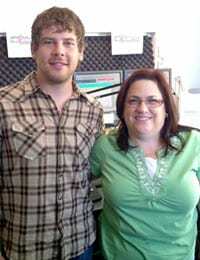 Headed toward the Top 40 are Jaron & TLRTL’s “That’s Beautiful To Me” at No. 51 and Walker Hayes’ “Pants” at No. 56. Brett Eldredge’s “Raymond” might catch them soon, as it packs on 140 spins and moves quickly to No. 66. Other new male artists climbing the chart include MCA’s Josh Kelley (“Georgia Clay,” No. 64), Bigger Picture’s Craig Campbell (“Family Man,” No. 73), and Arista/Sea Gayle’s red hot Jerrod Niemann (“What Do You Want,” No. 76). Due West recently visited WKCN/Columbus, GA to promote their new single “The Bible and the Belt.” (L-R): Tim Gates, Matt Lopez, WKCN PD Brian Thomas, Black River’s Rick Baumgartner and Brad Hull. 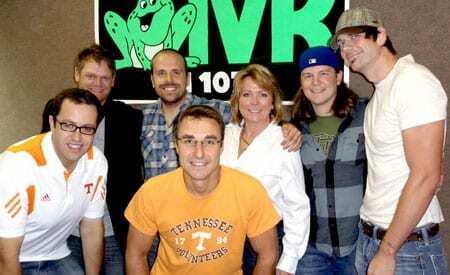 The Adam Craig Band (formerly TelluRide) scheduled a stop at WIVK/Knoxville while performing at several functions during last weekend’s University of Tennessee vs. Florida game. (L-R): Subway spokesman Jared Fogle, Ryan Jones, Brian Smith, WIVK morning show hosts Andy & Alison, Adam Craig and Jimi Hendrix.